VANCOUVER, February 26th, 2018 /CNW/ – Innovative architectural and structural design in taller and larger mass timber buildings headlined the 2018 Wood Design Awards event at the Vancouver Convention Centre (West) this evening. The 14th annual event, organized and hosted by Wood WORKS! BC, honoured excellence in wood building and design, and recognized leadership and innovation in wood use. Nearly 500 guests attended this year’s celebration of wood, including distinguished building and design professionals, owners, local and provincial government representatives, industry sponsors and guests. CLICK HERE FOR THE FULL MEDIA RELEASE or, VIEW THE FULL LIST OF NOMINEES HERE and, Profiles on the winning projects can be viewed HERE. You may also view the project story boards by clicking HERE. VANCOUVER, Feb. 29, 2016 /CNW/ – Inspired and innovative designs of wood structures in smaller urban BC centres and mid-rise construction were in the spotlight tonight at the 2016 Wood Design Awards in BC. Included in the awards were many impressive large public buildings including a museum, visitor centre and a diplomatic property located outside of BC and Canada. More than 350 distinguished design and building professionals, including architects, engineers, designers, project teams, industry sponsors and guests, gathered this evening to honour the nominees and winners of the 2016 Wood Design Awards in BC presented by Wood WORKS! BC. The 12th annual awards event at the Vancouver Convention Centre (West) recognized leadership in advancing wood use in design and building while being an opportunity to publicly salute and celebrate structural and architectural achievement using wood. There were 103 nominations in 13 categories from all over the province, as well as some national and international submissions, including England, Germany, Japan, China, South Korea and Taiwan for the new International Wood Design category. “BC’s leadership in wood design and building and our reputation as a global supplier of high quality wood products were very apparent here this evening. BC’s most visionary designers and project teams have once again embraced wood for its natural beauty, strength, flexibility, versatility, lower environmental impact and cost-effectiveness,” she added. The panel of four judges were: Ian Niamath, Architect AIBC, Dip. Arch., Poly., RAIC, Nanaimo, BC; Joseph Mayo, Assoc. AIA, LEED AP, Mahlum Architects Inc., Seattle, WA; Mark Porter, FIStructE, P.Eng., Struct.Eng, Division Manager – Buildings & Facilities Technical Services, Associated Engineering, Burnaby, BC and Peter Wood, Western Canada Region Manager, Weyerhaeuser, Vancouver, BC. A Special Recognition Award was presented to University of British Columbia by Wood WORKS! BC by Hon. Steve Thomson, Minister of Forests, Lands and Natural Resource Operations for the university’s leadership in wood design and building. UBC is the site of many iconic buildings featuring technologically advanced wood products and systems made in BC, which also supports its sustainability goals. “UBC is proud to be the recipient of this unique award by Wood WORKS! BC. It will serve as a lasting reminder of the central importance of wood and forestry to the history of UBC, from the creation of the botanical garden and arboretum on the Point Grey campus in 1916 to the building of our new all-wood student residence to be completed later this year,” stated UBC Interim President and Vice-Chancellor, Dr. Martha C. Piper. “UBC’s first century has coincided with the development in British Columbia of one of the finest wood industries in the world, characterized by a spirit of innovation and entrepreneurship. As UBC moves into its second century, we look forward to strengthening our relationship with that industry and contributing to its success through learning and research on the campus and in the field,” concluded Dr. Piper. The Wood Champion Award was presented to Vancouver-based and nationally recognized specialist in fire engineering, Andrew Harmsworth of GHL Consultants Ltd. Mr. Harmsworth is a long-time advocate of using wood as a safe and fire-resistant construction material. He was chosen for his contributions to the establishment of wood-friendly building code changes and for his leadership on tall wood construction in BC and Canada. A leader and key driver in mid-rise construction in BC was the 2016 Engineer Award recipient. Thomas Leung of Thomas Leung Structural Engineering Inc. of Vancouver was honoured for his firm’s efficient designs and practical solutions in the popular six-storey light-frame wood construction sector. His projects include MEWS at UBC, Emerald Heights in Surrey and Dominion in New Westminster. With a long-time commitment toward innovation, the Architect Award winner’s name is synonymous with advancing the use of wood in mid-rise construction. Patrick Cotter, of ZGF Cotter Architects Inc. of Vancouver, was the 2016 recipient of the Architect Award. He pioneered the first six-storey wood-framed residential building in Canada, and is an advocate for promoting wood as a sustainable and optimal material in the design and construction of housing. His projects include Quattro in Surrey and Parc Riviera in Richmond. The Wood Innovation Award recognizes creative and innovative approaches in the use of wood in building design, product design and/or processes. The winners of this category were Toronto-based Stephen Teeple of Teeple Architects Inc. and Edmonton-based Brian Bengert of Architecture Tkalcic Bengert for the Philip J. Currie Dinosaur Museum in Wembley, Alberta. 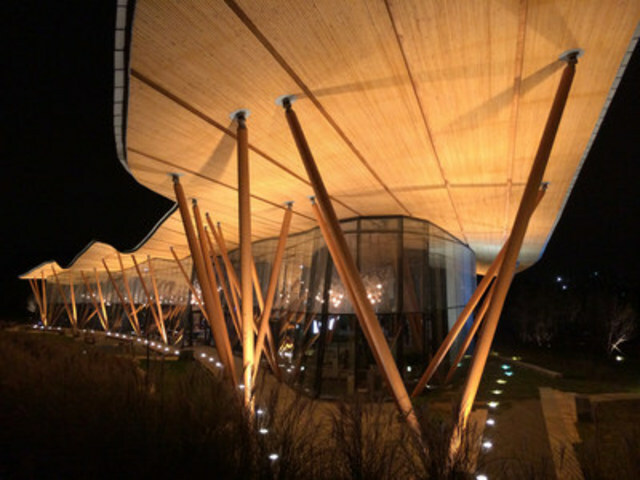 New technology was developed to build the wood structure, and the project has pushed the boundaries where wood can be used as a viable and sustainable structural system for large buildings. BC wood products and systems were featured throughout the project. The Environmental Performance Award winner demonstrates a significant contribution to improving the overall environmental performance of any building. The 2016 award went to Whistler-based Karen and Karel Jonker, owners, and Matheo Durfeld of BC Passive House for Alta Lake Passive House in Whistler, BC. The use of wood was the natural choice to achieve a structure that met Passive House efficiency requirements without compromising design. Prefabrication of many elements further contributed to the environmental performance of the home, which is both comfortable and beautiful. The Sustainable Forestry Initiative (SFI) Award was presented to KH Designs of West Kelowna for the Quilakwa Centre in Enderby, BC. The project owner, Splatsin, along with other project team members was on hand to receive the prestigious award, part of the North American Wood Design Awards. 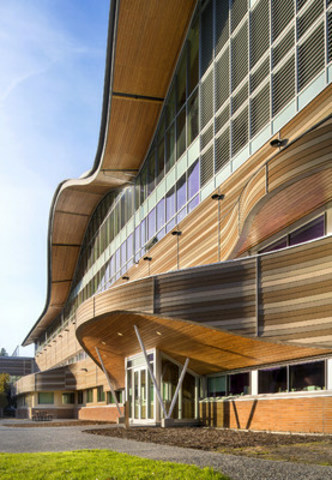 The jury gave the UBC Student Union Building high accolades, stating, “….it’s a noteworthy project for its use of wood to create a warm, comfortable space on an institutional scale.” Calling the Guildford Aquatic Centre “an architectural beauty”, the jury noted it as “an excellent example of the flexibility of wood, with the prefabricated wood components providing added benefits along with eye-catching results”. “Wood WORKS! BC congratulates the winners for their inspired and innovative designs which display the many attributes of wood, as well as the wood product manufacturers whose high quality products make these spectacular buildings possible. Their contributions are building economic prosperity in our communities and creating beautiful streetscapes and living environments for our citizens,” concluded Ms. Embury-Williams. Wood WORKS! is a national industry-led program of the Canadian Wood Council, with a goal to support innovation and provide leadership on the use of wood products and systems. Through workshops, seminars, symposia and case studies, Wood WORKS! BC provides education, training and technical expertise to building and design professionals involved with commercial, institutional and industrial construction projects throughout BC. VANCOUVER, March 2, 2015 /CNW/ – Innovative architectural and structural design in large wood buildings, including mid-rise and commercial structures, headlined the 2015 Wood Design Awards event at the VancouverConvention Centre (West) this evening. The 11th annual event, organized and hosted by Wood WORKS! BC, honoured excellence in wood building and design, and recognized leadership and innovation in wood use. More than 360 people attended this year’s celebration of wood, including architects, structural engineers, project teams, local government and industry sponsors. Monday, March 3, 2014 10 years of Wood Design Awards in B.C. were celebrated by more than 350 distinguished design and building professionals this evening at the Vancouver Convention Centre (West), including architects, structural engineers, project teams, local government, industry sponsors and guests. Nominees and winners of the Wood WORKS! BC 2014 Wood Design Awards were honoured and recognized, as were those who have participated in the Wood Design Awards in B.C. during the past decade. Coastal BC swept the 2013 Wood WORKS!BC, Wood Design Awards, with projects of the winning architects and structural engineers located in and around Vancouver and the Gulf Islands, including three projects on the UBC campus. More than 350 distinguished design and building professionals, including architects, engineers, project teams, industry sponsors and guests gathered this evening to honour the nominees and winners of the 2013 WoodWORKS! BC, Wood Design Awards. The 9th annual awards evening at the Vancouver Convention Centre (West) recognized leadership and innovation in wood use while being an opportunity to publicly salute and celebrate continued excellence in the building and design community. The Wood Champion Award was presented to Vancouver-based and internationally renowned structural consulting engineering firm, Equilibrium Consulting. Its principals, Eric Karsh and Robert Malczyk were chosen for their work on such projects as City of North Vancouver Civic Centre Renovation and Prince George Airport. Founded in 1998, this firm has been successfully involved in over 800 projects world-wide, including many award-winning designs. The BC architect who nominated this firm for the 2013 Wood Champion Award had this to say about Equilibrium Consulting: “As architects that are fascinated by structure, we ask a lot of them in pushing the limits of wood technology. They always deliver for us and have helped us create some very unique technical solutions. Their ability to resource solutions from Europe and adapt them to Canada has been exemplary for improving the wood design industry as a whole”. Elegant solutions with brilliant engineering are the hallmarks of this esteemed firm. In addition to finding solutions for large scale commercial projects, he has been actively promoting solid wood construction as a viable alternative to concrete, and as an answer to going taller with wood. He is also co-author of the widely publicized “Tall Wood” report (co-authored with BC architect Michael Green, principal at Michael Green Architecture, formerly principal at mgb ARCHITECTURE + DESIGN), which introduces a structural concept to build timber high-rises of 30 storeys or more, even in high seismic zones such as Vancouver. Honourable mentions were presented to two noteworthy projects and their designer/project team: Kinsol Trestle Rehabilitation Project, Cowichan Valley, BC, (Gord Macdonald, Macdonald & Lawrence Timber Frame Ltd.) which is one of the largest wood structures in the world, and in the words of the jury, truly outstanding from an engineering perspective; and the Pallas Residence in Revelstoke, BC, (Keith Starling, Take To Heart) which was noted as an exemplary example of a truly green building. Constructed of solid-wood-wall panels and assembled with solid wood screws by Olaf Felgendreher at Pacific Timberworks, the result is a highly-efficient building with little impact to the environment. “Wood WORKS! BC congratulates both nominees and winners for their achievements and we thank them for enthralling and inspiring us with their distinguished projects,” concluded Ms. Tracey. Wood WORKS! is a national industry-led initiative of the Canadian Wood Council, with a goal to support innovation and provide leadership on the use of wood and wood products. Through workshops, seminars and case studies, Wood WORKS! BC provides education, training and technical expertise to building and design professionals involved with commercial, institutional and industrial construction projects throughout BC. Russell Acton, Acton Ostry Architects Inc.
Philip MacDonald, Philip MacDonald Architect Inc.
Craig Duffield, McFarland Marceau Architects Ltd.
Nicola Valley Institute of Technology, Merritt Architect:Busby Perkins & Will Architects Co.